A report via PCGamesN points to some... interesting performance positioning when it comes to NVIDIA and AMD offerings. Battlefield V is being developed by DICE in collaboration with NVIDIA, but it seems there's some sand in the gears of performance improvements as of now. I say this because according to the report, AMD's RX 580 8 GB graphics card (the only red GPU to be tested) bests NVIDIA's GTX 1060 6GB... by quite a considerable margin at that. The performance difference across both 1080p and 1440p scenarios (with Ultra settings) ranges in the 30% mark, and as has been usually the case, AMD's offerings are bettering NVIDIA's when a change of render - to DX12 - is made - AMD's cards teeter between consistency or worsening performance under DX 12, but NVIDIA's GTX 1060 consistently delivers worse performance levels. Perhaps we're witnessing some bits of AMD's old collaboration efforts with DICE? Still, It's too early to cry wolf right now - performance will only likely improve between now and the October 19th release date. Yup, it's a good deal with freesync. I heard this monitor only goes to like 90hz in freesync mode tho. Dunno if I'm being 100% correct here. It does and I’m fine with that. I run most stuff at 90 but it does 144hz so the option for high refresh gaming is an option when permitted. Yeah I like sappire. And their support is good. Had two 290s die, both got replaced with a new one quickly. Wow that is horrible on the RX 580, I guess looking at figures on graphs doesn't paint the full picture after all. If that is the victory some people want, let them have it... i can see why it's a closed alpha! This is a cluster fist of stutters, totally unplayable on the RX 580. 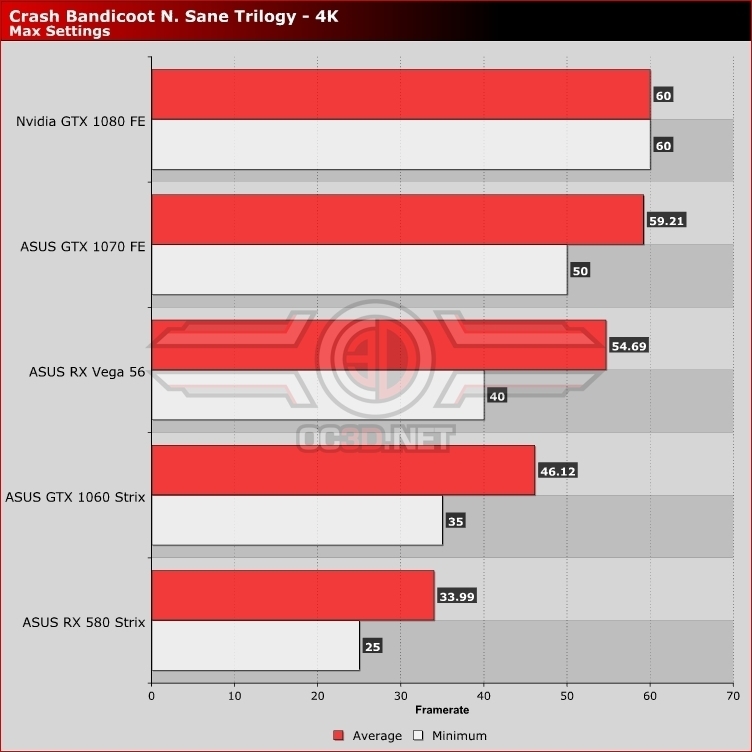 Great, AMDs low end cards do a bit better in one sources early alpha benchmarks. What a win! Must be a really slow news day to have posted this garbage. If the game has some extra stuff only for geforce cards, then this difference in performance can be explained. what difference in performance ? By a very small margin that is within the statistical variance between the two cards, and not the same as the outrageous previous result. I wonder if TPU will modify it's news piece to include this benchmark now ..
Why would they change it when hardly anything actually changed. Satistical variance here is signified by the variable nature of the game. The ranking, as expected, is still the same. Funny , it's 4K as well , how about that. The resolution that's "irrelevant". Do you people have nothing better to do than endlessly spam this thread with charts and wishful thinking? Why would they change it when hardly anything changed. Satistical variance here is signified by the variable nature of the game. The ranking, as expected, is still the same. Do you people have nothing better to do than endlessly spam this thread with charts ? What the hell do you think you're people doing spamming this fake news thread with facts from reputable sites like pcgh,hwluxx or sweclockers. lol, I was joking about the 4K performance, neither of them can run 4K. Why would they change it when hardly anything actually changed. Satistical variance here is signified by the variable nature of the game. So now statistical variance is important? where was that when AMD was ahead according to one site? it's 4K as well , how about that. The resolution that's "irrelevant". Want some 1080p numbers? Here you go, just don't feel sad because they are now dead even! The ranking is still the same. The game has no built in benchmark therfore results are highly variable when testing. However should there be a faster card , on average that card should eventually emerge on the top. And it does. You can spam us all you want with your charts , it paints the same picture in this context and I am astonished that you can't see that. It's like you have shutters on. I say you had enough hair splitting and straw debating for today. Basically you can't come up with anything to prove me wrong , huh ? It's fine buddy , don't worry. Well, can you come up with anything to prove you right yourself ? Unless by being right you mean grasping at straws and bending whatever puny evidence you have to your liking. I said this thread should be over after the pgch video and I was right. Just because it's an NVIDIA partnered title doesn't mean Frostbite is all of the sudden slanted towards NVIDIA GPUs. Frostbite has always been a balanced engine that gives good performance for both red and green. Wait for wait for it, another game where the 1060 is 40% faster than RX580 @4K! Will the media write about this now? Will the media write about this now? Dude , you seriously need to find something better to do with your time than scrounging the net for benchmarks and post them on here , let this thread that's full of nonsense die already. It's a good game but I don't think anyone is interested in benching non-AAA titles. That's why they're making a big deal out of BF5 alpha, but smaller games get no coverage. No one seems to care that amd is getting absolutely destroyed in frostpunk, even though it's a fantastic game. One chart about bf5 alpha and the internet is on fire. It's a shame though that people took the bait cause those numbers were absolutely fake. This type of news is what happens when people are looking for evidence of a predetermined conclusion, sometimes forgetting to verify the source.